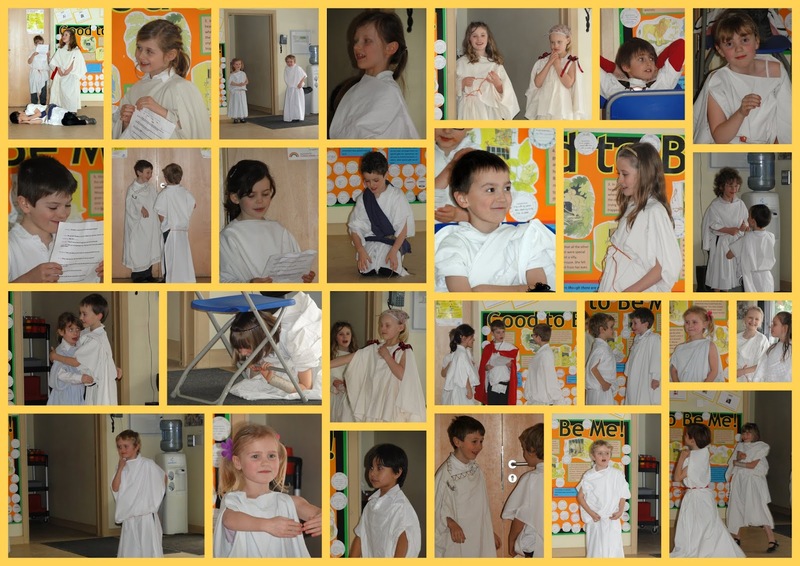 On Thursday we celebrated the culmination of our half-term's work on Romans in Blue Class, and Greeks in Yellow Class, with an activity day, in which the children were invited to dress as an Ancient Roman or Greek. 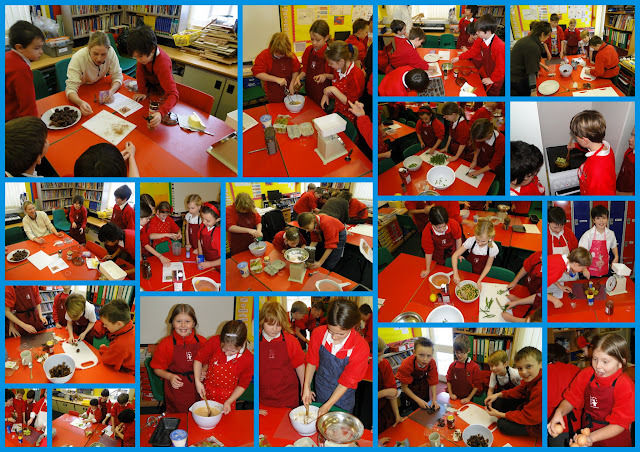 In the morning in Blue Class, we prepared a range of Roman recipes which were taken from the E2BN Cookit! website's History Cookbook. We worked in groups to produce a range of foods (most of which seemed to contain honey) including Bean and Chickpea Salad, Dates Alexandrine, Cucumeres, Tiger Nut Sweets and Honey Cake. 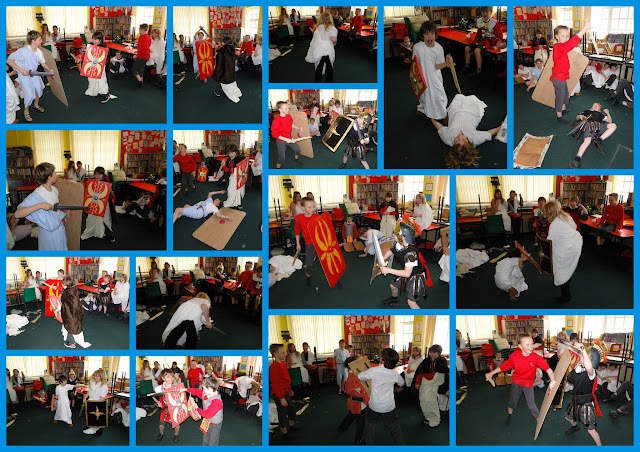 In the afternoon, we dressed up and took in in turns to be slaves, handing around the food to our wealthy masters and mistresses, who were lounging on the floor in true Roman style. 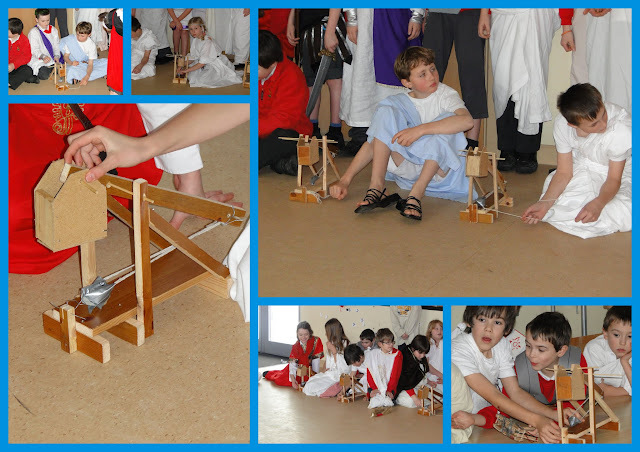 With adrenaline pumping we then set off to the hall where it was finally time to test the trebuchets we had been building in groups. Our target was the fort we produced last week, the ultimate test against marauding hordes! We were then treated to some Greek Tragedies: a collection of short plays based on Greek myths, performed by Yellow Class. Thank you to all the parents who produced the lovely costumes to make this such a special day. We had a fantastic time! Well this half term has been educational for me as well, I now know about all the Labors of Herakles & how to make a Trebuchet! 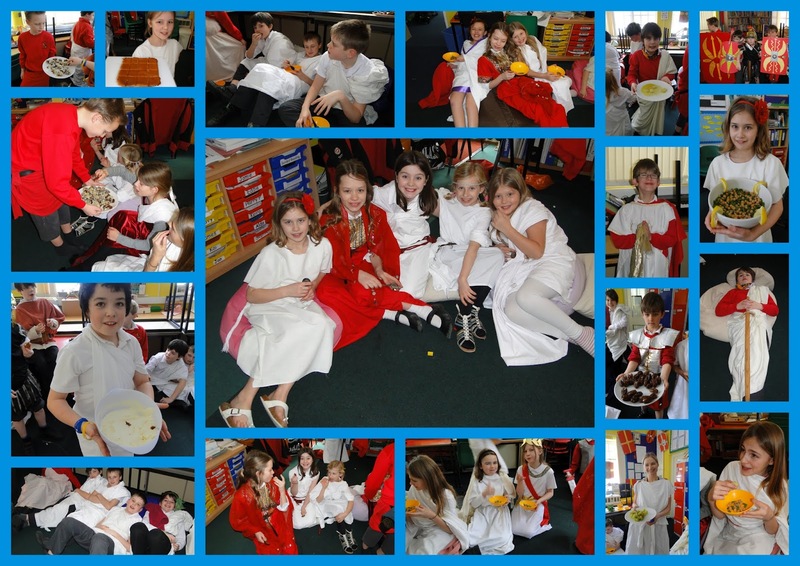 My children have loved learning about the Greeks & Romans and the end to the half term was excellent as they loved dressing up, having a banquet & acting out the tragedy. It really has made this learning process fun for them. I look forward to learning something new next half term!